In a previous article, I discussed what the difference was between submersed and emersed growth. Now, I'll show you how to set up your own emersed growth pots so you can experiment on your own. 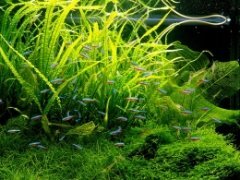 I've been growing HC, dwarf hairgrass, and moss emersed without problems. Stem plants probably won't do so well using this method, as they are much harder to convert. For quickly growing pre-made carpets though, this method can't be beat. First, you'll need a shallow container. I use plastic Rubbermaid shoe-boxes available at most big stores like Target or Wal-Mart. They are the perfect size, since you'll want to cover your container with plastic wrap. Larger containers will also work, but may be harder to cover and keep sealed. Fill the container with about 1 inch deep of regular potting soil. Pour water in until the soil is just submerged but thoroughly wet. Then, take your plants and just put them gently in the soil. Once you have all of your plants planted, use plastic wrap to cover the container. You'll want a tight seal so the moisture doesn't evaporate. It might be necessary to use some tape to keep the plastic wrap from coming off. This will create a nice humid environment for your plants to transition to emersed growth so they don't dry out. Once you have your container all set up, you can either put it in a sunny window or underneath some full-spectrum lighting. I chose to put it under a strip of lights (see above). Each week, just lift the plastic wrap up and using a spray-mister, mist the plants to replenish any lost water. Lifting up the plastic also allows new air to enter, replenishing any CO2 the plants have used. No fertilization is necessary, since all nutrients should be present in the potting soil. Once your carpet has grown in, just gently lift the plants out of the potting soil, rinse them off to remove any extra soil in the roots, and plant them in your aquarium. It might be best to stick with one type of plant per container, since I tried HC, hairgrass, and moss all in one and they all grew together (see above). It makes it a bit difficult to separate, but very cool looking! This method should work well for all mosses, most grasses, and most other carpet plants, like Hemianthus callitrichoides and Glossostigma elatinoides. Mosses in particular have very different emersed structures and can be quite cool looking. It's almost tempted me to start a palaudarium! Good luck. I'd like to try your method out but it's quite warm where I live (Manila, 24-32C). I imagine the temperature inside your container is much higher than the ambient room temperature due to the greenhouse effect? Do you have any measurements of these and any ideas how I can reduce the greenhouse effect while keeping my container moist? Your post is interesting. Thank you. May I translate it into Vietnamse for my aqua-club's friends? Sure, you may translate it as long as you provide a link back to this article. The container shouldn't get too hot under a normal light. In the direct sun it might though. You can try putting a fan near it to blow across it to try to cool it if it is an issue. i think you don't need a plastic to cover them, because many of people in my country has growing many carpet plants without it. But, i don't know yet, maybe using plastic was faster than not.. I find the valuable information is provided by you about to the plastic cards container.I appriciate the skills of your blog writing and the time sharing with us. "Full Spectrum Light" is a pretty Vague term. Could you give more info on that such as wattage and kelvin rating? I have one that is kind of a pinkish/purple light that gives off more blue and red spectrum than the others. I also have a 10,000K that I could try this with. Teh 10,000 K is the twisty energy-saver bulb type and the other is a u-shaped 20 watt aquarium bulb. that is nice sharing about the plants and useful links and informatve post about that. I think you are doing really difficult task. I like your idea about making our own emersed growth pots But i don't think so we can achieve this target without having a lot of resources. Hello, Thanks for your informative blog. Have you ever grown dwarf sage?